sold for $39,000 in one of past auctions. or an offer of Outright Purchase. WHY SHOULD YOU CONSIDER SELLING ALL OR A PART OF YOUR COLLECTION THROUGH A SHEFFIELD AUCTION? 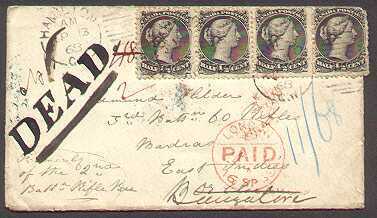 At Sheffield's our stamp auctions have become a popular choice for collectors, dealers, or estate executors who have material to be sold. The competitive bidding generated produces fair market value for the items bought and sold. We know you have put a lot of time, effort, and plain old hard earned money into building your collection. For this reason, we take the time to lot your material down to as little as $50; even smaller for an unusual item or outstanding specimen. In short, we work on your behalf to seek the highest possible return. That's why we break collections into the smallest possible lots - to achieve the highest possible realization. This way you receive good value for your entire collection, not for just a few selected items. The big auction companies have such high overhead and operating expenses that they aren't able or willing to break your collection down the way you would like them to. They simply can't take the time to remove every stamp that might realize $100. Sometimes you're lucky if they take out anything smaller than a $150 realization. 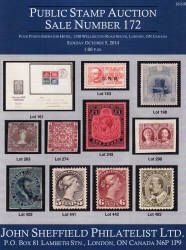 We maintain a large list of serious buyers of all types of stamps and covers. This means your material will be seen by a large number of prospective buyers, not just locally, but worldwide. In addition, buyers can access our sale catalogues through the Internet. Our sale catalogues contain the information which really matters to the auction buyer: - accurate descriptions of all items offered and thorough photographic coverage. Complete insurance coverage is provided on all material, from the time it reaches us until it's sold. Auction commission rates are competitive and we do not have any hidden charges for lotting, describing, insuring, or photographing material. Your entire transaction is handled professionally from start to finish. We provide the expertise to lot and accurately describe all types of material; specialized, large lots, or unusual items. We take pride in providing a first class, professional, and personal service.We have helped thousands of customers dispose of a wide variety of material. Many have written with their personal comments regarding the service they received. To say I am happy with the result would be an understatement. Overwhelmed is more appropriate. I feel like one of the people you see on the Antiques Roadshow who has a treasure but does not know what it is worth. Thank you!! .......... H.H., Chilliwack, British Columbia. Realizations were way beyond my expectations. I'm very happy with the result. Extremely satisfied with the prices you were able to obtain. .......... E. T., Toronto, Ontario. As soon as I saw your catalogue I knew I was dealing with a professional organization. 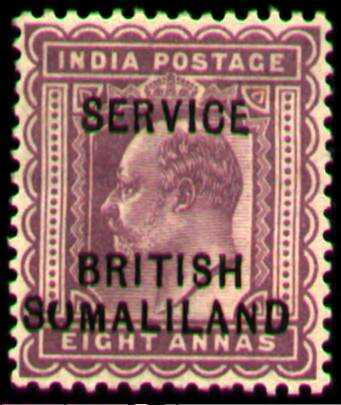 We accept all types of stamps, covers, old postcards, proofs, etc. from all countries for auction. Prompt settlement is always made, usually within 45 days of the sale. When necessary, cash advances are available. Email us today at john@johnsheffield.com if you would like your material included in an upcoming Sheffield auction. 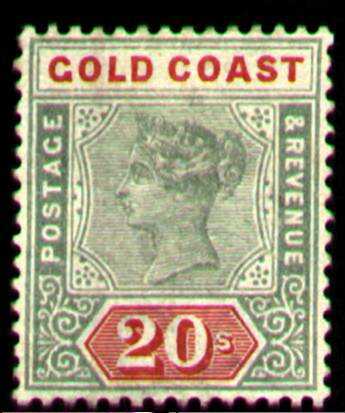 Selling through Private Treaty or an outright Offer to Purchase from us are also popular choices for collectors and dealers who want to sell their material. Private Treaty allows you to set your own price for material. Your stamps are coded then added to our retail stock and appear on our regular price lists and special offers, both the printed versions and those appearing on the Internet. Our mailing lists contain names of serious buyers of material realistically priced at current market value. Since our mailings reach the four corners of the globe, we have collectors looking for all types of material, from the standard to the exotic. Private Treaty commission rates are competitive and prompt settlement is the norm rather than the exception. Please e-mail us for further information regarding Private Treaty as an option for disposing of your material. Selling through Public Auction or an Offer To Purchase from us are also popular choices for collectors and dealers who want to sell their material. If you prefer, we will make a cash offer for your collection. We can quote from your detailed inventory listing. Of course the quote will be much more accurate if we have the opportunity to view your collection. Please e-mail us for an appointment or for shipping instructions. We provide complete insurance coverage while your collection is in transit. Our written offer to purchase, along with our cheque, will be in the return mail within 48 hours. Naturally, we will travel to purchase larger holdings. Selling through Public Auction or Private Treaty are also popular choices for collectors and dealers who want to sell their material.